Highlights this quarter include a new indicator illustrating that 42% of the cancer literature indexed by PubMed is available as free full-text within 3 years of publication; ongoing strong growth in open access archives and their content; milestone of over 10 million free texts for Internet Archive; a mix of negative growth reflecting clean-up at DOAJ and growth in articles searchable at the article level; over 50% annual growth at the Directory of Open Access Books; and concern noted about the apparent ongoing growth of Elsevier and what this might mean for open access. 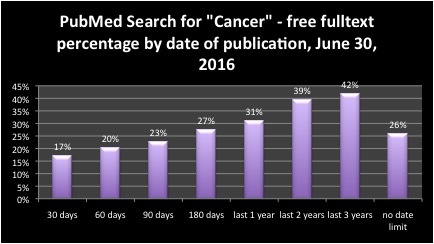 New indicator : a search of the PubMed index for "cancer" for all articles and with limits by date of publication demonstrates that 42% of the cancer literature indexed in PubMed published in the last 3 years is available as free fulltext. 17% is available as free fulltext within 30 days of publication, 31% within one year of publication. With no date limits the overall percentage is 26% of the 3.3 million articles on cancer indexed by Pubmed. Results of PubMed search for "cancer"
Kudos to Internet Archive for exceeding 10 million free texts! Ongoing strong open access archives growth is illustrated by OpenDOAR adding close to 200 repositories over the past year, a 7% growth rate and a total of over 3,000 repositories. The Registry of Open Access Repositories added 269 repositories over the past year, also a 7% annual growth rate for a total of over 4,000 repositories. The Bielefeld Academic Search Engine is now searching over 93 million documents from over 4,000 repositories. With growth of over 18 million documents over the past year (24% annual growth rate), it won't be long before BASE passes the 100 million milestone. arXiv grew by over 10% over the past year, adding over 100,000 documents for a total of 1.6 million. The Directory of Open Access Books grew by over 50% in the past year for a total of close to 5,000 books from more than 150 publishers. In spite of overall negative growth reflecting a major "get-tough" clean-up project, the Directory of Open Access Journals' number of articles searchable at the article level which grew by 16% over the past year, over 300,000 more articles for a total of over 2.1 million articles. On May 9, DOAJ removed over 3,000 journals that had not filled out the new application form. Since that date, DOAJ has added 234 titles for a DOAJ growth rate of 4.5 journals per day. Watch for continuing strong growth in the next few quarters as DOAJ has hired a team of international ambassadors. The Social Sciences Research Network (SSRN) is still included in the downloadable data. I would like to note concern about its current and future open access status and commitment, particularly since it was recently bought by Elsevier, features the ad for "free subscriptions to more than 500 partner-sponsored abstracting e-journals [emphasis added]", (copied below for purposes of academic critique - please contact SSRN for other uses), the SSRN website indicates partnerships with providers of pay-per-view, and the message from chairman Michael Jensen on the Elsevier sale indicates that part of what is behind this is Elsevier's desire to expand into social sciences. In addition to the SSRN buyout, as noted on my research blog Sustaining the Knowledge Commons, Elsevier is now the world's largest open access publisher as measured by number of fully open access journals. Open access may resolve the access problem, however OA per se does not address the increasing commercialization of scholarly journal publishing and increasing market concentration that has been happening since the end of the second world war. The growing presence of large traditional commercial scholarly publishers in open access is something to watch, in particular because ongoing open access is likely not compatible with maximal profit-making. Kudos are in order to Canada’s government for global leadership, commitment, and swift moves by our new government to action, notably in the areas of commitment to open access and open data to both academic and government information, commitment to creation of a Chief Science Officer position, restoring the mandatory long form census, forthcoming free and more timely access to Statistics Canada data, and initiating electoral reform (to mention a few moves!). Following are my comments as an expert in the area of information policy, notably open access, intended to help strengthen a solid, ambitious but realistic draft plan. In the spirit of openness and transparency, note that I am a professor at the University of Ottawa’s bilingual School of Information Studies and I see career opportunities for our graduates and research opportunities for me arising from this plan and some of my suggestions. · Reconsider centralization or the “one-stop” approach. Sometimes this is a good idea (one stop search for grants and contributions, single point of access to all geospatial data). However, centralization can also be a bottleneck and even a muzzling device. Decentralization with website and open data development in the hands of departmental experts who understand the information they are working with and how people will want to use it is probably in many instances the most effective means of providing open government information and data. I want my weather information directly from Environment Canada and my tax data directly from Canada Revenue Agency, not indirectly from a central service where staff are not likely to be experts in these areas. · Consider expanding information services to include reference service (professional service by intermediaries with understanding of information seeking behavior as well as government information), both through government and indirectly through libraries of all types (through advocacy for this role with key partners). This has the potential to provide better service and sometimes reduce cost. For example, in the area of Access to Information, overly broad requests may reflect lack of knowledge of the specific documents or data most likely to address a need. Direct communication with requestors may be the best means to hone requests. · Beware what I characterize as a blind spot of completely unrestricted re-use which could lead to intended consequences (for example effectiveprivatization of currently free public services). Impose reasonable expectations of behaviour by re-users that is in the public interest, and encourage development along these lines at the global level. · Remember the vulnerable. Sometimes the best approach to open government is in-person offices. Open data and data visualization are a boon for those of who can see but a challenge for the visually disabled. Proactively address this challenge rather than waiting for complaints. Consider and consult First Nations peoples before releasing data about resources on their lands or lands that they depend on that could be exploited to their detriment. · Build in protection against the inevitable temptations of power and the understandable human tendency to want to look good. Access to Information – an effective means to demand information that the government does not choose to make open – will always be needed for really open government. I also recommend an arms-length approach to developing data visualization services, because it is easy to develop services that help people to see what we want them to see; our truth rather than the truth. · Considerable research is needed on how to go about meaningfully engaging a whole population in open dialogue and policy-making. This particular potential of open government will take an extended period of time for full development. This should be factored into assessment of progress. · Immediately apply principles and best practices of open dialogue and policy-making in trade treaty negotiations, beginning with the Trans Pacific Partnership. · Expand on corporate accountability through a review of legislation on corporations and consultations with the private sector, academics and other stakeholders to understand barriers to triple bottom line accounting (finance, people and environment) and propose solutions. Detailed comments are presented below in two sections, Overarching comments and specific comments on the draft plan. To centralize or not to centralize? The draft plan refers in several places to centralization (single portal, one-stop etc.). I recommend re-thinking of the benefits of centralization versus decentralization. Sometimes, centralization can result in streamlining of access for the citizen; commitment 11, one-stop access to data on grants and contributions is a good example of this. However, centralization can also be a bottleneck or even a muzzling device. Weather information is both interesting and important to the public. To have the best information on whether a potentially dangerous storm is headed in my direction, I look to the experts at Environment Canada to post what they know as soon as they possibly can. Sending information to a central service would simply create delays and likely impede good decision-making by Canadians. Governments create different departments for good reasons. The type of information provided and how it is best structured to be understood by the public will vary with the type of information. When it’s time to reconcile my taxes I want a website that is under the control of the best experts in taxation and web development for this type of information. I note below particular sections of the plan where I see centralization as beneficial or problematic. Reference and information literacy services are needed (directly through government and indirectly through libraries) and would reduce in some cases reduce the workload. As a professor in the area of information studies, former practicing professional librarian and researcher in the areas of open access, open government, and access to information, I have had many discussions with students, experts, and government staffers who provide services such as responding to ATI requests about the challenges and opportunities. In my professional opinion, the Government of Canada could provide better service, sometimes at lower cost through a kind of service akin to the tradition of library reference services. For example, one of the reasons ATI requests can seem to be “frivolous and vexatious” appears to be that people request very large amounts of information because they do not have sufficient understanding of government operations to know what to ask for. Having a professional serving in an intermediary role who understands both information seeking behaviour and the kind of information that is held by government would likely be more efficient in many cases. Helping people find the information they need (reference services) and providing education on how to understand the need for information, find, evaluate and effectively use it (information literacy), is a traditional role of public, school, corporate and academic libraries. Recommendation: work with Library and Archives Canada and open government representatives at all levels (municipal, provincial, global) to advocate for an emerging role for libraries of all types in the areas of open government and incorporate professional information services within government departments. Moving towards openness and transparency in government while at the same time failing to engage with citizens on trade agreements that will impact our jobs, communities, and businesses, is moving in opposite directions at the same time. Recommendation: extend open dialogue to trade treaty negotiations, beginning with the Trans Pacific Partnership. Open data and the potential for data visualization offer tremendous potential for the advancement of Canadian society and should be embraced. However, the formats also create new challenges for people with disabilities such as print disabilities. Recommendation: address these challenges proactively through working with groups representing disabled communities and show global leadership in advocating for technological solutions to facilitate equitable open government. The plan appropriately recognizes the need to consider the protection of personal privacy in the release of open data. I recommend that potential harm to vulnerable groups be another consideration in deciding whether data should be released. For example, data about valuable exploitable resources on lands our First Nations peoples own or depend on should not be released without consultation with the peoples who would be affected. Suggestion: split into 2 bullet points to avoid confusion because Access to Information and open data initiatives are two very different types of activities. Re: the fifth grand challenge, “Increasing corporate accountability”: measures that address corporate responsibility on issues such as the environment, anti-corruption, consumer protection, and community engagement. Re: Third paragraph, “Being “open by default” also means allowing Canadians to more easily access government services through a single online window [emphasis added]”. Recommendation: change this sentence to “Being “open by default” also means allowing Canadians to more easily access government services through effective access mechanisms designed to facilitate accountability on service delivery [emphasis added]”. Comments: see “to centralize or not to centralize” above. It is good to see a commitment to updating the Access to Information Act. Open government will never replace the need for a mechanism for citizens to effectively demand access to information. Government by definition holds power, and power inevitably will attract those who wish to pursue personal gain through corruption. Also, mistakes and poor decisions or even good decisions that did not produce the expected results cannot always be avoided. There will always be a temptation for government staff as well as elected representatives to open or close, highlight or suppress information based on whether it makes the government look good. If you don’t want to release a piece of information it’s all too easy to perceive a request for the information as “frivolous and vexatious”. An important strength of the action plan is “giving the Information Commissioner the power to order the release of government information”. Comment: re the second suggested bullet, see the section “reference and information services” above. Re: How it will be done – line 2: “a simple, central website [emphasis added] where Canadians can submit requests to any government institution”. Suggest change to: “a simple, central website where Canadians can submit requests to any government institution to supplement requesting services that are most efficiently handled by the collecting department”. Comment: see the section on “to centralize or not to centralize” above. Re: Milestone 4: “Update Library and Archives Canada’s online archive of the Government of Canada’s web presence to ensure Canadians’ long-term access to federal web content”. Recommendation – add a Milestone: consult with academic experts and Library and Archives Canada to develop a plan, recommendation and funding analysis to capture Canadian content on the web. Comment: I applaud the addition of this milestone, but would note that we need to capture Canadian content on the web in general, not just federal web content. Currently, some of this content is voluntarily captured by Internet Archive, however I think Canadians have a duty to take this on ourselves, for profound social, legal and cultural reasons. Material that until recently was produced in print and often archived and preserved by libraries and archives is increasingly available only online and risks being lost, sometimes after only a short period of time. Re first Milestone “Development a Government and Canada Clients-First Service Strategy that aims to create a single online window [emphasis added] for all government services”. Suggest change to: Development a Government and Canada Clients-First Service Strategy that aims to create a efficient and effective online access [emphasis added] for all government services through a departmental or centralized online window, whichever is most effective for citizens”. Comments: see to centralize or not to centralize above. Re: “The Government of Canada will expand collaboration with its provincial, territorial, and municipal partners and key stakeholders to develop a searchable National Inventory of Cultural and Heritage Artefacts to improve access across museum collections”. Re: second paragraph, “…the government will provide Canadians [emphasis added] with the tools they need to visualize spending data and compare fiscal information across departments, between locations, and over time”. Suggested change to “…the government will develop an arms-length service to provide Canadians with the tools they need to visualize spending data and compare fiscal information across departments, between locations, and over time and encourage all members of the open government partnership to do likewise”. Comment: it is fairly easy for an interested party to set up visualization tools to “help” people see things like financial data from a particular perspective. This can be deliberate or reflect unconscious biases. For example, to help people understand tax data, one can choose from a number of different potential comparison points. The tax freedom date approach showing how long it takes an average Canadian to work to pay taxes before they get to keep money is a good choice for people ideologically opposed to taxation and seeking tax breaks. In contrast, those of us who think public health care is the right way to go both for social and financial reasons tend to see data demonstrating the lower per-capita health spending in Canada as compared to countries with private health care as an obvious and important way of demonstrating the truth. A government that has succeeded in lowering corporate taxes by two-thirds and does not want public critique creeping into public budget discussions might be tempted to present budget data showing how little is gained by a small to medium increase in the existing corporate tax rate and avoid historical comparisons. A government determined to reserve the corporate tax rate cuts would likely emphasize historical comparisons. Re: “The Government of Canada will provide access to the datasets used in the Federal Budget each year in near real time [emphasis added]”. Suggested change (addition) to: “The Government of Canada will provide access to the datasets used in the Federal Budget each year in near real time starting with Budget 2017 and will explore the feasibility of providing as many of these datasets as possible in advance of the release of the budget. Comment: near real time datasets to help Canadians understand the budget would be a major leap forward, however in the long term for Canadians to have meaningful input into the budget process and parliamentarians to have full information for decision-making purposes, we have to have access to the datasets before the Budget is developed. One thought is that after Budget 2017 the datasets identified for release could be prioritized for timely open data release after that point in time. Re: “one stop access”: in this instance centralized access makes a lot of sense! Comments: although the spirit of “no restrictions” is one that I agree with, a major positive change, and internationally embraced by open government advocates as consensus, this is an area where in my professional opinion too open an approach invites problems as well as benefits for the social good. For example, as contributors to the Social Sciences Research Network (SSRN) recently discovered, their free sharing of their work in what they thought of as an open access archive enabled not only open access but also the sale of SSRN to the world’s largest commercial scholarly publisher, Elsevier, a corporation that benefits from a profit rate of about $1 billion US a year (39%) profit based primarily on toll access and that has incentive to create new locked-down services. I believe this is an early indication of a potential danger of open data that is too open. For example, in the case of government data, too open an approach to data release could result in effective privatization of public services. “Without restrictions on reuse” is so broad that it can include charging for services, paying Internet service providers to have for-pay services prioritized over free public services, making the latter less useful, and using profits to lobby against funding for free public services that profitable commercial re-users are likely to see as competition. Open data should be open to anyone, not just Canadians. In order to have the full benefit of open access to government data we need to be able to use data from any jurisdiction and compare data across jurisdictions. Re – second paragraph: “the Government of Canada will be building strategic partnerships with other governments at the provincial, territorial, and municipal level, to support the development of common standards and principles for open data”. Comment: good idea, but add the global level; this will be necessary to create innovations that work across jurisdiction and allow cross-jurisdictional comparison. Comments: kudos, this is great to see!!! Note that the granting councils already have policies on open access to research outputs and digital data management strategies. With respect to open access to documents, it might be worth looking at the tri-agency policy. With respect to digital data management strategies, there are important differences between government data, collected by the government for purposes of public policy, typically collected by government staff in the course of their employment and originally owned and controlled by the government, and academic research data which frequently involves third parties such as research subjects and third party organizations (e.g. police data is important to criminologists, business data to business researchers). Here I see many more issues arising from opening of data and I recommend separate treatment of academic research and government data. This is a great initiative, but this is where building in the concept of free reuse in the context of commitment to the public good (see C above) is important to avoid the potential privatization of free public services. Re: Milestone 1 “Promote common principles for Open Dialogue and common practices across the Government of Canada to enable the use of new methods for consulting and engaging Canadians”. Comments: I think that this is a great idea, but the potential of Web 2.0 to facilitate open dialogue and open policy making is in its infancy. Consider that we are still working towards universal basic literacy centuries after the invention of the printing press. I think that considerable research into how to use the web for open dialogue and policy making is needed, and how to engage citizens who may not have access to the web or are otherwise unlikely to use this means of participation. Perhaps this could be one of the upcoming challenge areas for the granting councils? (Disclosure: if this happens I might apply for such a grant). Recommendation: add a strong, specific commitment to increase the number of indigenous Canadians receiving benefits or perhaps a specific type of benefit to which they are entitled. In conclusion, please consider these detailed comments as input intended to improve a solid plan ambitious plan by a new government that already deserves kudos for swift action in a number of important areas. Thank you for the opportunity to provide these comments, and to be actively engaged in the preceding in-person and online consultation processes.